Aftermath [Amazon | B&N | IndieBound] is the first book of Chuck Wendig‘s Star Wars trilogy that connects the period between Return of the Jedi and The Force Awakens. The book has generated some strong and at times vicious reactions. A voice. Her voice. The Zabrak’s. Then thrusts the heel of her hand forward. Smashing it right into the Herglic’s nose. The style took me a few pages to get used to, but I thought it worked. It creates a faster-paced flow to the prose, which worked for all of the Star Warsy action. That said, if you prefer an invisible writing style, this book might not work for you. 2. Aftermath is almost entirely about original characters. Han and Chewie get a very brief cameo. Admiral Ackbar pops up a few times. Wedge Antilles has a more significant part in the story. 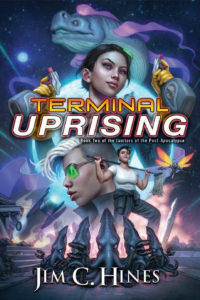 But the book mostly focuses on new characters, like a pilot from the attack on the second Death Star who’s suffering from PTSD and trying to reconnect with her son after being gone for so long; an ex-Imperial loyalty officer; a bounty hunter; and a small group of Imperial officers trying to figure out what the heck to do now. I liked the characters. But if you’re hoping for Luke Skywalker lightsabering stormtroopers or Han and Leia flirting and arguing and blasting bad guys or maybe a glimpse of baby Rey or baby Ben/Kylo or baby Finn, you’re going to be disappointed. All main characters are females. Except Wedge Antilles. And Sinjir. And Temmin. And Mr. Bones. And…yeah. There were complaints about the inclusion of gay and lesbian characters. I guess magic space wizards and giant asteroid snakes are fine, but loving someone of the same gender is just too much to believe. A lot of the reviews attacked the writing style as well. Like I said, the style might not work for everyone, and that’s fine. But complaining that the author uses sentence fragments and therefore doesn’t know how to write? Um…y’all know authors sometimes break elementary school writing rules for various reasons, right? Or folks saying they could have written a better book when they were 13? Go ahead and try it. We’ll wait. Me? Like I said above, I liked it. I appreciated seeing some of the costs of the war, and the ethical issues Wendig delves into. The interludes were a nice addition, showing the aftermath of the Battle of Endor throughout the galaxy. The story itself was self-contained, but at the same time lays the groundwork for the rest of the trilogy. There’s plenty of action. And of course, Mr. Bones is fun (and disturbing) to watch. I’ll be picking up the sequel, Aftermath: Life Debt. Welcome to the first of 24 Transgender Michigan Fundraiser auctions! We begin the fundraiser with autographed copies of the Star Wars novels AFTERMATH (paperback) and AFTERMATH: LIFE DEBT (hardcover), by Chuck Wendig. These are the first two books of the trilogy linking Return of the Jedi to The Force Awakens. Both books were New York Times bestsellers. You can read an excerpt from the first book online. This auction is open to people outside of the U.S., but they will need to cover shipping costs. Minimum bid is $20. Bidding starts the moment this post goes live! Enter your bid in the comments. Bids must be a minimum of $1 more than the previous bid. (No bouncing from $20.01 to $20.02 to $20.03 and so on.) Make sure to include an email address I can use to contact you.